Father of Joseph, a physician, and Ḥayyim. He and Abraham Canombrial were grandfathers of the mother of Moses Almosnino, and were burned at the stake by the Inquisition (Steinschneider, "Cat. Bodl." col. 1771). Rabbi in Tetuan. He is the author of "Mishmeret ha-ḳ;odesh" (The Holy Charge), a supercommentary on Rashi's commentary on the Pentateuch, published at Leghorn. 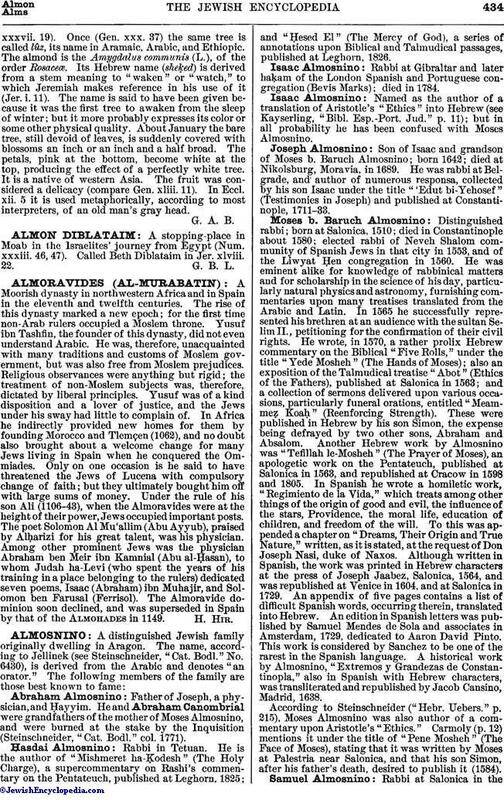 1825; and "Ḥesed El" (The Mercy of God), a series of annotations upon Biblical and Talmudical passages, published at Leghorn, 1826. Rabbi at Gibraltar and later haḲam of the London Spanish and Portuguese congregation (Bevis Marks); died in 1784. Named as the author of a translation of Aristotle's "Ethics" into Hebrew (see Kayserling, "Bibl. Esp.-Port. Jud." p. 11); but in all probability he has been confused with Moses Almosnino. Son of Isaac and grandson of Moses b. Baruch Almosnino; born 1642; died at Nikolsburg, Moravia, in 1689. He was rabbi at Belgrade, and author of numerous responsa, collected by his son Isaac under the title "'Edut bi-Yehosef" (Testimonies in Joseph) and published at Constantinople, 1711-33. Distinguished rabbi; born at Salonica, 1510; died in Constantinople about 1580; elected rabbi of Neveh Shalom community of Spanish Jews in that city in 1553, and of the Liwyat Ḥen congregation in 1560. He was eminent alike for knowledge of rabbinical matters and for scholarship in the science of his day, particularly natural physics and astronomy, furnishing commentaries upon many treatises translated from the Arabic and Latin. In 1565 he successfully represented his brethren at an audience with the sultan Selim II., petitioning for the confirmation of their civil rights. He wrote, in 1570, a rather prolix Hebrew commentary on the Biblical "Five Rolls," under the title "Yede Mosheh" (The Hands of Moses); also an exposition of the Talmudical treatise "Abot" (Ethics of the Fathers), published at Salonica in 1563; and a collection of sermons delivered upon various occasions, particularly funeral orations, entitled "Meammeẓ. Koaḥ" (Reenforcing Strength). These were published in Hebrew by his son Simon, the expense being defrayed by two other sons, Abraham and Absalom. Another Hebrew work by Almosnino was "Tefillah le-Mosheh" (The Prayer of Moses), an apologetic work on the Pentateuch, published at Salonica in 1563, and republished at Cracow in 1598 and 1805. In Spanish he wrote a homiletic work, "Regimiento de la Vida," which treats among other things of the origin of good and evil, the influence of the stars, Providence, the moral life, education of children, and freedom of the will. To this was appended a chapter on "Dreams, Their Origin and True Nature," written, as it is stated, at the request of Don Joseph Nasi, duke of Naxos. Although written in Spanish, the work was printed in Hebrew characters at the press of Joseph Jaabez, Salonica, 1564, and was republished at Venice in 1604, and at Salonica in 1729. An appendix of five pages contains a list of difficult Spanish words, occurring therein, translated into Hebrew. An edition in Spanish letters was published by Samuel Mendes de Sola and associates in Amsterdam, 1729, dedicated to Aaron David Pinto. This work is considered by Sanchez to be one of the rarest in the Spanish language. A historical work by Almosnino, "Extremos y Grandezas de Constantinopla," also in Spanish with Hebrew characters, was transliterated and republished by Jacob Cansino, Madrid, 1638. According to Steinschneider ("Hebr. Uebers." p. 215), Moses Almosnino was also author of a commentary upon Aristotle's "Ethics." Carmoly (p. 12) mentions it under the title of "Pene Mosheh" (The Face of Moses), stating that it was written by Moses at Palestria near Salonica, and that his son Simon, after his father's death, desired to publish it (1584). Rabbi at Salonica in thesixteenth century. He was the author of a commentary on some of the minor prophets, published among the rare commentaries, in Moses Frankfurter's large Bible, Amsterdam, 1724-27; also of a commentary on the Pentateuch, with particular regard to Rashi's commentary. Grätz, in Monatsschrift, xiii. 23 et seq. 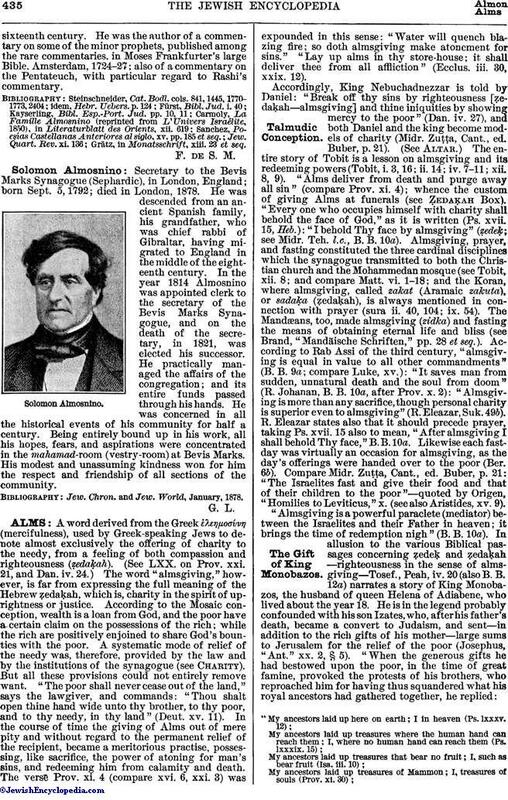 Secretary to the Bevis Marks Synagogue (Sephardic), in London, England; born Sept. 5, 1792; died in London, 1878. He was descended from an ancient Spanish family, his grandfather, who was chief rabbi of Gibraltar, having migrated to England in the middle of the eighteenth century. In the year 1814 Almosnino was appointed clerk to the secretary of the Bevis Marks Synagogue, and on the death of the secretary, in 1821, was elected his successor. He practically managed the affairs of the congregation; and its entire funds passed through his hands. He was concerned in all the historical events of his community for half a century. Being entirely bound up in his work, all his hopes, fears, and aspirations were concentrated in the mahamad-room (vestry-room) at Bevis Marks. His modest and unassuming kindness won for him the respect and friendship of all sections of the community. Jew. Chron. and Jew. World, January, 1878.